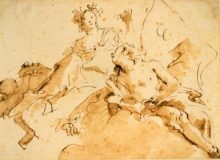 This plate appeared in the tenth part of the Liber Studiorum series, and is based on sketches made during Turner’s 1802 European tour. He travelled specifically to see the Alps and this print belongs to the ‘Mountainous’ category, hence the letter ‘M’ inscribed above. 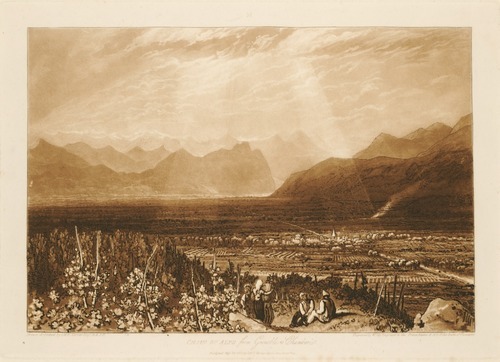 Grenoble was the first point he reached in July of that year and the image captures the artist’s excitement on his first glimpse of the mountains. The aerial perspective reveals an extensive vista while the peasants looking directly out of the frame welcome the traveller into the scene. The friendly rural figures and the strong shafts of sunlight bathing the town create a romantic atmosphere of anticipation, in great contrast to the dominating Alpine landscape of ‘The Lake of Thun’ (Inv. No. 39.16). We show a rotating selection of works on paper in our two dedicated exhibition spaces. If you wish to view a work not currently on display, you can make an appointment to see it in the Prints and Drawings Study Room, which is equipped with lecterns and a study/seminar table. The study room is open to students, scholars, and members of the general public, individually or in small groups, by prior appointment only. The room has tables and chairs to facilitate private study or seminars.